I have often been asked to explain the fundamentals of 70:20:10 as a strategic framework quickly and simply. I wrote the one-page ‘primer’ below to serve that immediate purpose. Please feel free to use it for any non-commercial purposes. It is published here under the Creative Commons: Attribution – Non-Commercial – Share Alike Licence (CC BY-NC-SA 2.0 UK). If you are looking for a more detailed resource, see below the Primer. 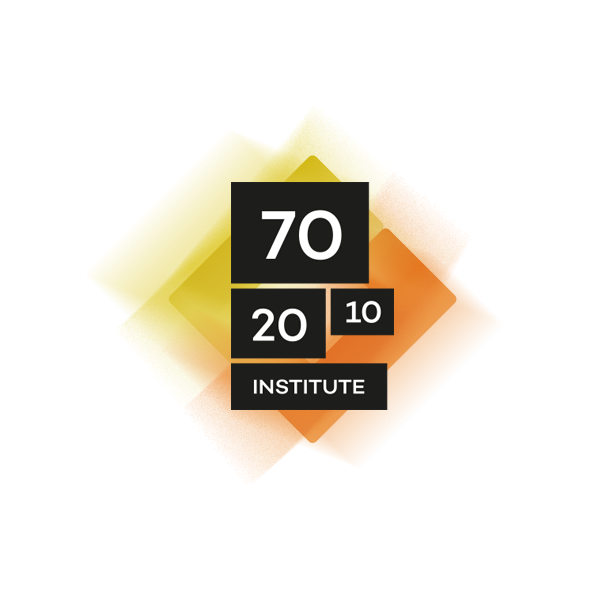 70:20:10 is a reference model or framework that helps organisations extend their focus on learning and development beyond the classroom and course-based eLearning to build more resilient workforces and create cultures of continuous learning. Although the 70:20:10 model is primarily a change agent, the numbers serve as a useful reminder that most learning occurs in the workplace rather than in formal learning situations. It also stresses that learning is highly context dependent. However, don’t make the mistake of quoting the numbers as a mantra or as fixed percentages. Research over the past 40 years has shown that informal and workplace learning is increasingly pervasive and central to learning in organisations. Studies have produced varying figures of the amount learned in these ways. Each organisational culture will display its own profile of workplace, social and structured development opportunities, and the distinctions between the ways of learning often blur. It is important not to put the three elements in the 70:20:10 model into separate ‘boxes’ in practice. They are interdependent. For instance coaching, mentoring and courses work best when they support on-the-job development. With its emphasis on learning through experience and with others, the 70:20:10 framework helps extend the understanding of what learning means within organisations. It also moves us from ‘know-what’ learning towards more effective ‘know-how’ learning. In summary, 70:20:10 helps change mindsets and learning practices. For some time I have been working with two friends and co-authors on a practical book titled ‘702010 Towards 100% Performance’. This book delves deep into implementing 70:20:10 as a strategic L&D tool and defines new L&D roles and tasks to support the process. The book is large and comprehensive (300+ pages in ‘coffee table’ format and weighing in at around 4lb/1.8kg!). It provides detailed guidance, lots of checklists, tools and process support resources as well as insightful contributions from leading experts. It was published in Dutch in June 2015. The English version will be available in November 2015. Jane Hart’s 9th Annual ‘Top Tools for Learning’ Survey closes on Friday 19th September 2015 and will be published the following Monday. If you haven’t already voted, please take a visit here and do so if you’re reading this before the close date. If it’s too late, make sure you’ve marked up the action to contribute to next year’s survey. Google Search: ‘Professor Google’ is he is known in my house. Like the brains of many professors, the information you’re looking for is usually in there somewhere, but sometimes difficult to pin down. However, Google has provided a public searchable store of enormous magnitude – larger than anything seen before in humankind history – and is without doubt the most used learning tool by many, if not all, of us. We can barely imagine life without Google Search. Twitter: I have learned more in my professional life through Twitter in the past six-and-a-half years than in the previous 30 years. For me Twitter gives access to smart people who provide an enormous wealth of information and insight through their commentary and links to research, articles and other resources. Twitter is the first tool/resource I access every day – even before I turn to see the sports results! Evernote: Tools for managing the tidal wave of information we are all subjected to are an absolute necessity. If we’re not to drown under uncategorised information overload, and if we’re to reduce the time we spend trying to find the ‘right stuff’ at the right time we need tools like Evernote. It’s certainly a tool that works for me. Evernote is the frontal lobe of my ‘external brain’ (where Google Search is probably the rest of my digital cerebral cortex). Evernote is on all my devices and I use it every time I want to save an interesting ‘snippet’ that I may want to access and use in future. Dropbox: This tool lowers my blood pressure better than tablets ever could. It has removed the fear of losing everything if a hard disk crashes or a backup fails. It also allows me to collaborate and share files and resources with others – whether they are colleagues and translators working on the English version of the new ‘70:20:10, Towards 100% Performance’ book we’re just finishing, or clients who want to co-ordinate materials for a masterclass. Dropbox has also removed the embarrassment of arriving somewhere far-flung from home to find the workshop materials or keynote slides are still sitting on the office computer or on a memory stick that’s fallen under the bed in my hotel room. As a learning tool, Dropbox is the school satchel – keeping everything organised, safe and dry. Skype: Skype offers the magic of essentially free multimedia global communication and learning. 25 years ago the Boston Consulting Group was predicting a future of virtually free telecommunications. That prediction came true much sooner than BCG thought it would. Of course Skype has glitches and issues, and its new owner Microsoft is trying to extract value from users, but with a decent broadband connection Skype offers the real-time and asynchronous communications we could have only dreamed about 25 years ago. Together with my colleagues in the Internet Time Alliance, we use Skype as our principal digital ‘glue’ to share and learn in a continuous flow. YouTube: YouTube is the digital ‘master’ I turn to when I’m trying to do something new and need guidance. YouTube is my ‘20’ support to help me learn through the ‘70’. Whether it’s discovering how to use some function in Excel or how to fix a laser printer, YouTube invariably offers help and guidance. YouTube is also the wonderful conduit for sharing expertise in other ways, whether it’s through TED Talks or hundreds of other video resources. It’s pretty helpful when I’m trying to improve my musical skills, too. Google Scholar: When I’m researching something, Google Scholar is the first port-of-call. A quick search for ‘workplace learning’ on Google Scholar returns almost one-and-a-half million results in less than a tenth of a second. Then that’s the day gone as I sift through relevant papers and find myself ordering books and diving off in all directions, reading and learning as I go. Google Scholar provides the library index and stack we could only dream about 40 years ago. LinkedIn: Gone are the days of trying to keep track of people in Microsoft Outlook or some other contacts list. LinkedIn does that job well. But LinkedIn is much more than just an online contacts list. It provides a stream of updates from people I know and groups I’ve joined. LinkedIn allows for deep discussions with other professionals – always a great learning opportunity. I’m a member of far too many LinkedIn groups. The Harvard Business Review group discussions alone could probably occupy all of my time. PowerPoint: Although PowerPoint’s linear nature is often restricting, I’ve never found Prezi or other tools as robust and flexible. PowerPoint is the useful ‘Swiss army knife’ in the toolbox for assembling presentations and creating simple flow diagrams and graphics. It handles the integration of video and other multimedia reasonably well and is ubiquitous. I’m sure there are better tools than PowerPoint, but it does the job for me. Flipboard: A tool I couldn’t do without on my iPad. I use Flipboard as my blog and news aggregator. Whether it’s my colleague Jane Hart’s C4LPT site, Harold Jarche’s Adapting to Perpetual Beta site, Jay Cross’s Internet Time blog, Clark Quinn’s Learnlets, Nick Shackleton-Jones’ fascinating Aconventional site, or Tom Stafford’s unbelievably extensive MindHacks neuroscience and psychology resource (I remember Tom when he was just a schoolboy – we can certainly learn a lot from the next generation). Flipboard brings them all together under a simple interface. Of course there are other tools I use for learning – Wikipedia (naturally), Blogger (that’s where this blog sits), Audacity for audio work, Google Hangouts, Microsoft Live Writer and others. But the 10 above are my principal daily workhorses.